Can I tell you how much I enjoy making school-lunch for my kindergartner? This is a phenomena to me! I hate cooking. I abhor baking. Lunch around here is usually pretty simple; chicken nuggets & fish sticks, cheese-sandwiches or quesodillas. We don't deviate very much. So I am just amazed at how much I enjoy pulling out *E*'s lunch-box every night and finding good food to put in it for the next day. It is also nice that I haven't raised a picky-eater. Maybe I should rephrase... It is nice that *E* is not a picky eater because his younger brother takes the cake on being the picky-eater. But every day he comes home and tells me about his *great* lunch, as if I had nothing to do with it. It just warms my heart to know that in the middle of his busy kindergarten day he sits down and eats a meal that *I*, his lowly mother, put together. Maybe in two weeks I'll be sick of making lunches and will turn to purchasing Lunchables... but until then every night as I put together his lunch I think about him and this great big Kindergarten world he has entered. I put my *kindergartner* on the school bus for the first time Tuesday. He was so very excited! He practically lept onto the bus. 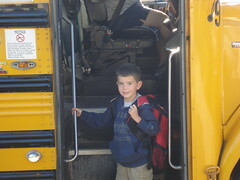 He had a new backpack, new lunch-box, and a smile for the new kindergarten day ahead of him. He climbed into the front seat and peered out the window & gave a huge wave as the bus pulled away. Yesterday (Wednesday), I volunteered at the lunch-hour to help with the kids' various needs; lots of go-gurts to open, straws to put in juice boxes and other package opening requirements (thank goodness for scissors). I really enjoyed it. I got to see the faces of *E*'s new classmates, and while everyone was eating I enjoyed standing around his table and engaging them all in conversation. However, at the end of lunch the bomb dropped. *E* was ready to go home. There were tears, pleadings, cries for mercy and I had to look him sternly in the face and tell him that he needed to stay and finish up his school day. UGH, everything in me wanted to march him out of that building and bring him home. Everything in me recognized that there was no easy way to get him to let go of my leg. So 'mean-momma' (but oh so loving-momma) had to come out and do the '1 - 2 - 3' thing. 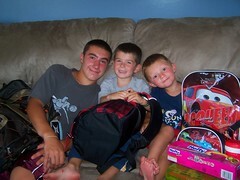 (The boys know if they don't stop before I get to 3 they are in big trouble whatever the situation may be.) Reluctantly, he walked into his classroom; eyes red, still trying to catch his breath, and mad at Mom. I walked out of the building knowing that I did the right thing, but wishing I hadn't had to. He got home on the bus at 4:00pm, skipping across the road as he had done the day before. I peered in his backpack and found a note from the teacher that he did just fine the rest of the day. I had a sneaking suspicion he would. But was thankful for the note! It was a nice piece of reassurance that this boy has wings but sometimes needs to flap a little harder to get off the ground. MilitaryAvenue Partners--Why should you use them? We have over 6,300 listings from MilitaryAvenue Partners who offer you, the military consumer, a discount or special service which we call a Military Reward! They vary from the Base Sponsorships belonging to larger companies to the free ads sponsored by businesses that just want to let you know about them and their services and products! We also have national corporate sponsorships and of course we love the mom and pop businesses (frequently owned by military families) that have built an ad. "The summer of 2008 is almost over with Labor Day upon us and the Farmer’s Almanac is calling for a cold winter with above average snowfall for most of the US! I don’t think I am ready for that yet! At MilitaryAvenue we have been extremely busy as we continue to develop new and innovative ways to connect you, our partners with our military customers. As I like to say, MilitaryAvenue.com provides the STREET between the inside the gate community and Your outside the gate business! We have started our “Alert” email system to allow the military families to receive email alerts from us announcing MilitaryRewards in their area and to bring your Reward to their attention! This system is directly linked with another innovation which allows the military community and others to sign up for a “User Account” which expedites their searches for services and products at their home installation. It brings them our newsletter as well which features our services and products and improves page views and more opportunities for you to be seen. Also by using their User Account military personnel can report a great experience with your business by providing a rating on the site. Military personnel like to tell others about their great experiences with a military friendly business so look for these comments coming in your direction. Encourage military personnel who you have served well to make comments! We are also in the middle of some new developments to keep us dynamic and user friendly coming in the fall! We will have a National MilitaryReward page on the site for companies with a national product and a military discount soon! Again, this is a new innovation to attract military personnel who will have more page views and the opportunity to see your ad! We continue efforts to expand our sponsor base with new programs as well. We are excited about these opportunities and our continued growth and what that means for you, Our MilitaryAvenue Partners!" I encourage you to sign up for the alerts, provide comments on Partner ads that you have used and let them know you appreciate their efforts to share with the military community! They care about you and want your business. Now let them know you care too and appreciate their help. Yesterday I watched my two neighbor girls, age 6 and 8. Their mom, a good friend of mine, is a teacher and had an in-service day and so had to find child-care for the day. I was more then happy to oblige for a number of reasons. The girls get a long very well with my two boys so although I was 'babysitting' them, in a sense they made my day very easy as the four kids played *all day*. There was THAT much less whining going on and that much more self-sufficiency. A second reason I didn't mind watching the girls was they are a good influence. I don't 'appreciate' all of *E*'s friends quite as much. There are even friends that HAVE to stay outside, we don't come in to play. There is a little more rough-housing with them, a lot more messes, a touch more feelings-getting-hurt, and way too much whining. There were still messes yesterday and I'm sure a time or two when *E* got upset because things weren't going his way; but nothing too out of the ordinary that wasn't a learning experience in one way or another. We all need friends, my 3- and 5-year old included. They smile more, laugh more, run harder, rely on me less. Help your children find friendships that are healthy: through church, in the neighborhood, from school. Friendships that help them grow, not bring them down. Invite those friends over to play and watch your children blossom! Love Quilting? Do you have enough fabric to cover the state of Texas? I am so afraid that I might fit into both of those... not that the first is a problem... but it brought on the second! The best part of quilting is the creative energies that are generated - and the production of your own piece of art and comfort! Here is a great way to get together with fellow quilters and share the lot: The Great Watercolor Fabric Swap. 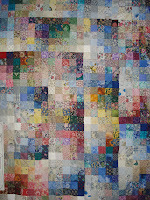 I love these quilts, as the use a variety of fabric (all 100% cotton). Have fun, laugh, take pictures and send them in! It is so much fun to see the products that you make! You can now 'rate' the companies & businesses in your area that are MilitaryAvenue.com Partners. Find your installation, click on "Military Rewards" and see if you have done business with any of our partners. We would love to hear from you & so would your fellow military families looking for military-friendly businesses in your area! PS Don't see a favorite area business but want to be able to share them with the military community? Encourage them to become a MilitaryAvenue.com partner. A military-discount or -incentive equals free advertising for them! I must admit, I love pie. Wait, I love dessert. But pie in someway makes me think there is a healthy side to the indulgence: fresh fruit. The a la mode addition doesn't help the cause, nor do the dollops of whipped cream. Back to reality and food function! The foundation of a good pie is the crust - and here I realize that is the part that I really love - the other is a means to a great crust. A crust that is flaky, holds together and easy to handle. The uses for this crust can be highlighted in chicken potpie, an ultimate comfort food that you can tweak to be your all time favorite. And of course a way to use the fresh fruit harvest that is appearing at Farmer's Markets now. Ice water. Have a 1/2 cup ready, but you will not use that much. Measure flour, oatmeal, salt into a bowl. Cut in shortening thoroughly. Pour 1/2 of the water on top of dry ingredients. Shake the bowl to help it be absorbed. Add more, shake again. DO NOT over stir the crust. You want it to be 'unworked'. When it holds together, there is enough water - it should not be too sticky - just enough moisture for it to cling to the side of the bowl. The humidity in the air will determine different amounts each time you make crust! Gather dough into a ball: divide in two, leave one half in the bowl, cover with a damp towel to keep moist, the other half flatten on a floured surface. With a floured rolling pin, roll the flattened dough 2" larger than the pie pan. Fold pastry into quarters; unfold and ease into pie pan. I would love to hear how you used this crust. If you have additions to it... herbs, cheeses, or whole wheat, let me know! Send a picture - make us all hungry! Cooking up great tastes is a hobby enjoyed worldwide. If you are a facebook user you can favorite MilitaryAvenue.com! "Where I have Served: America Supports You - My Military Avenue". You can make your great big world that much smaller. Not that I understand it... Summer is coming to a close. The school supplies have arrived, many summer vacations are now history and family and friends are gathering to squeeze one more weekend together outside in the sun and fun. While time is being spent outside, let your oven slowly cook up a great dinner. A slow cooked Brisket of Beef serves a crowd and compliments all summer vegetables. If you have canned tomatoes, or if they are heavy on the vine, and need to be savored, here is the opportunity one more time! 2 cups red wine or (1 can of coke!) yes, coca cola! Last week we had some Air Force friends visit who we had not seen for a couple of years! What fun it was to share old stories and laugh (or in some cases shake our heads wondering what were we/they thinking)! After retiring from the Air Force both couples relocated for jobs and family ties purposes and they are now in Atlanta and we are in Michigan so keeping in touch is fun but a visit is always better. 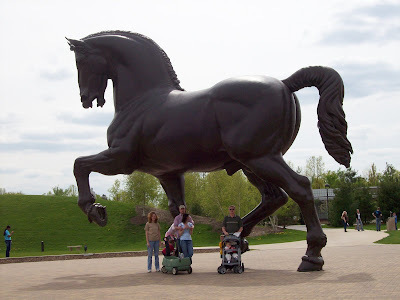 We took them to a local site, Meijer Gardens for a long walk to see the wonderful statues and flowers. The picture taken earlier of the huge horse sculpture is a sample of the wonderful variety of the gardens. We enjoy their special events too such as Christmas when they feature tree decorations from many different countries of the world. Its great to see decorations from countries you visited or lived in while on active duty. We then headed out to Lake Michigan for a walk on the Grand Haven pier and a visit to their old lighthouse. You can walk out to the end of the pier to enjoy the waves and for a view of the nearby beaches. We then stopped at the Coast Guard Exchange at Grand Haven for a cool drink after the long walk on a wonderful 75 degree afternoon. Ed had not visited Lake Michigan before and was impressed with the visibility and size! I had worked in a tough job with Ed and he had so much knowledge of the mission and gave me wise advice so many times. We were fortunate to develop a bond that continued to our retirements and beyond the Air Force. Mary had also helped our son Dan become interested in computers when she hired him part time to help with her business. We participated in each others' retirement ceremonies and some day I will have to share a family moment of humor involving all of us. We now have Facebook and use the America Supports You My MilitaryAvenue application to say hi as well! Keeping in touch with military friends can be fun! Taking the time to do so is well worth the effort! I have a passion for pretty plates and dishes. I look for meals that compliment a color theme, or let me use a certain precious gift given to me by a Grandmother who's memory I hold dear. This great recipe uses fresh tomatoes and pungent basil. These tomatoes need to be skinless. This is a simple process. I put a small 'x' on the bottom side and cut out the stem on the top; add them to rapidly boiling water until the skin breaks - remove with a slotted spoon and put right in an ice water bath. The skin will fall off in your hands! Cube tomatoes, and add salt. Let them stand for 15 minutes. Place tomatoes in a strainer and squeeze out as much juice as possible. Let stand 10 minutes and squeeze again. Reserve juice for soup or something else wonderful. This juice can be frozen for a future use too. Return cubed tomatoes to bowl and add remaining ingredients. Gently mix. Serve on a small bed of lettuce on a pretty glass plate. Enjoy summer to the fullest! Reynolds & Reynolds went out of their way to support the troops at the start of this school year. Early in the summer they asked for school supply lists for all of Hubby's Brigade's children. Wow. So I did my best, after all all three of my children's schools were wrapping up the current school year, and not really thinking about next year yet. Basically, I found last year's school supply lists and forwarded it on to our Family Readiness Group leader. This morning I drove out to the house of a fellow Army family. Her husband is with my husband and she had been kind enough to pick up my boys' school backpacks at our last FRG meeting, which I couldn't make. Again I say "Wow." What a wonderful way to support the families of the troops! I know that from a little acorn, big trees grow. They are dropping all over our deck, and my bare feet get me hopping sometimes! However, out in our vegetable patch the acorn squash has spread its vines down the hills, up the fence and is quite cozy with the tomato plants. The problem with squash plants is, if you move the vines, or touch the fuzzy leaves, they up and die. Just like that. So, a few tomatoes are fertilizing the field under the vines. I love acorn squash. I think of it as a fall plant, but really it is a late summer addition. We serve this up brown sugared, baconed and baked! I acorn squash serves two nicely. Enjoy the nutty sweet taste! 6 slices bacon, crisply fried. On a small baking sheet pour 1 T of olive oil. Cut acorn squash in half, scoop out the seeds. Place the squash cut side down and spread oil around using the squash. Place in a 350 degree oven for 1 hour. Remove from oven. Turn oven off. On same baking sheet, with a flipper, turn squash over. Place 1 1/2 Tablespoons of butter in each half - with knife allow to melt all over the top side of the squash. Add 1 Tasblespoon of Splenda Brownsugar and 3 pieces of crisply fired bacon on top. Place back in the hot (off) oven for 20 minutes. Serve as a wonderful side dish - or main course of a Garden meal. ... ya it's not what you are thinking. I'm feeling thin like a piece of toast with BARELY enough butter to make it palatable. Thin like scrape the jar of peanut butter and come out with barely a knife full for a PB&J sandwich. Thin like no matter how hard you try you just can't get another drop of honey out of the honey jar. Thin like ... I think you get the picture. How do single-moms (or dads) do it?! Soccer has started with a bang and I have three boys playing this year, practices and games are weekly. (Daily practices actually for my high-schooler.) School starts in 8 days and there will be boys to be dropped off and picked up (one son can take the bus, one cannot as his school is about 30 minutes away from me). There are birthday parties to attend this week. MOPS steering meetings I look so forward to but take another chunk of time. I promised the boys we would go to the zoo one more time before school started. Plus there is the day to day stuff; like work, dinner preparations, laundry, yard-work, dusting (ha! I just had to throw that in there), and somewhere I do need *some time* for myself (a shower is a necessity once in awhile after all!). So I've never felt spread this thin in my life. I know I will survive! It just makes me appreciate Hubby that much more I suppose [either that or curse his name for not being home ;)]. Sometimes OPSEC is just an acronym many folks do not know the definition of or if they do know it means Operations Security they are not sure how it affects them. In fact, military families may not understand that it may directly affect the safety of their loved ones and the members of the unit they belong to. I usually illustrate the point by telling the story from when I took part in a special mission involving the movement of "high value" passengers. There had been a revolution in Iran and the Shah and his family had left the country. We watched from our overseas location having no idea that it would impact our location or unit but it became very real and close and personal. When the Panamanian president, Omar Torrijos offered the Shah and his family a place to reside in during this very tumultuous time; he accepted. The embassy in Tehran had come under siege and the US was trying to ease the tensions and the Panamanian offer was quickly accepted (the Shah was in the US at that point). As a point of security the Shah's family was going to the Presidential compound on the island of Contadora and the plane from the US could not land there due its short runway. Now at this point the new government of Iran had offered a million dollars to anyone who killed the Shah! We were seeing that on the news. Then came the call to our unit to get our helos ready to finish the trip from Howard AB to Contadora. We put some special measures in place to protect the crews of the helicopters that were moving the Shah and his family and its luggage, pets, etc. We brought in bomb dogs, expanded security on the ramp, etc. Normal things for a high visibility visitor. A quick bit of geography to make clear the implications of the OPSEC violation that occurred later. Howard AB was on the Pacific side of the Panama Canal where ships waited their turn to enter the canal--sometimes there were 100 in the waiting area and most were "foreign flags". We had to fly over that area to get to Contadora with the President's guests. Also, there frequently was an Soviet spy ship in the area monitoring our communications including our phones. So there was motive and the means to take a free shot at a million dollars! About an hour before our takeoff a military member who should have known better told their spouse on an open phone line that the Shah was arriving and would be moved by our helicopters! The spouse decided to let a friend know about it too! I think the word quickly spread as others watching their TVs thought this bit of information just needed to be shared. But the implications were pretty clear! Imagine the crews surprise to learn upon returning after a very long day to find out that the whole base knew about the flights and what an extra risk it had provided to them. I remember being very surprised and a bit chagrined about it. I know my family when it was explained always understood the implications and always appreciated the value of good OPSEC! Protect your loved ones by thinking before emailing, picking up the phone or talking to the neighbors! We have had a great summer and the harvest season is here! Our garden after a lot of work is producing and we have started freezing and canning almost every day. What fun it is to see the fruits of our labor! We started with an empty spot under our power lines a couple of years ago and just kept adding space (plus a fence to keep the deer out). Now the rotor tiller has to work extra hard and long in the spring to get us started! The preparation and planting can be back breaking but healthy as we stretch out the muscles after a winter of cold. We had help from family and friends too (thank you Penny for watering and spraying while we were on vacation)! But the season we love is here with fresh vegetables for our salads at lunch and dinner plates with green beans, carrots, broccoli and so much more. 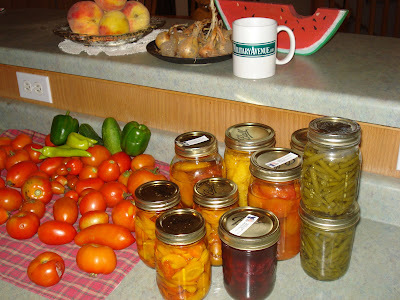 When we started getting more than we could eat or giveaway to family we started canning and freezing. We quickly filled our combination refrigerator and freezer! One day our neighbor who watches us work in our garden leaned over the fence and said he had a small freezer that was not being used in his garage and would we like it? The timing was perfect and we jumped on his kind offer. In addition to our vegetable garden we also have a wild blackberry patch and the berries are ripe now too! Earlier this week I took out an eager berry picker who at age 5 bravely fought off the long thorns to collect berries for snacks and cereal! E was a real trooper and shows a lot of promise for being grandpa and grandma's garden helper! I know he helps mom with their garden but it was fun to see his eagerness for the berry picking! His cousins, J and J are also quite the eager harvesters as they pull carrots to chomp on and berries are spread around their faces in the best possible ways! They comes from a long line of berry pickers so it must be in the genes! With E's dad deployed it is great to have him and his brothers visiting and keeping in touch during what must be very confusing times for a young child. What great technology though as they share webcam images and voices which military families a few years ago did not have! We eagerly await your return Paul--We have some vegetables we need to share with you! I am lost in thought this week as my sweet *E* is off to kindergarten the last week of August. I always thought I would be ready to kick him out the door but somehow the closer we get to *the big day* the more reflective, and a little sullen, I feel. He is my oldest; although my 14 year old step-son is our oldest. I feel like I am crossing into new territory as *E* crosses the bridge of preschool into public-school. So as our summer vacation winds down on Monday & Tuesday we took a quick 'road-trip' out to my parents house. They live far enough away that we can stay over-night but not so far that we can't just hop in the car and go. This trip I actually did something pretty smart. We had an earlier dinner on Sunday night, plopped the boys in pjs and hit the road. I pulled into my folks' house a little after midnight but the boys slept for a good chunk of the trip. I did that coming home, too. I always like it when we have a good-experience in the road trip department, and boys sleeping equals peaceful trip... ahhhhh... We had a birthday celebration for my mom, hit the botanical gardens in Grand Rapids, and spent some time swimming and sunning at my brother's pool. It was a jam packed fun-filled two days. Today we hits the zoo. We are members so each visit is 'free', covered in our membership fees. But it makes it so easy to just go on a whim and not feel like we have to stay all day to get the biggest bang for our buck. We were there today from about 1pm until 3:30pm. Saw a few of our favorite exhibits and then a few that we don't visit too often. It was a perfect afternoon! Talk about a ball of mixed emotions. Maybe this is one reason I struggle with *E* heading off to school. I will miss the fun and spontaneity of summer. Yet, I do look forward to the routine of autumn. 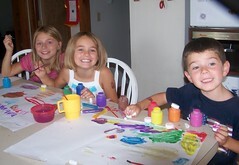 Our oldest starts high-school, middle starts kindergarten and youngest starts preschool. What a crazy, amazing year we have ahead of us! Today, I dropped the kids off at the sitter and on the way home BLASTED Rob Thomas. I have had a terrible headache all week, taken my doses of Frova, Excedrin, Al eve ... The Frova works the best (it is prescription after all) but the pain kept coming back day after day, night after night. I am happy to say after the ride home with Rob as my side-kick, I am headache free. I sang to my heart's content. It was a lovely series of duets ... He really should ask me to go on tour with him :). I was heading home from Ft McCoy at the end of June after saying goodbye to my husband, headed overseas. Tim McGraw & Faith Hill's "It's Your Love" was piping out of the car stereo. I had tears streaming down my face but a huge smile. My boys didn't even ask what was wrong because they know sometimes 'it is just the music'. That song summed up that moment for me and now every time I hear that song it will bring me back to that very moment. I have more songs than I can count that have a very dear meaning to me. Funny thing is if I fell off of the face of this earth the one thing my husband would NOT miss is the constant music flowing through our house. It is always on here. I would MUCH prefer to turn the TV off and the music on. We differ in that aspect. But he still loves me, 110%. So I hope he is enjoying these many months in his music-free zone. When the time comes I am sure I will find a great song that will always remind me of his homecoming and we will be sure to blast it to welcome him home! We have a wonderful wild blackberry patch in the "back 40" of our land and they are at the height of their season! We have had a couple of nice rainshowers recently and they are black and fat and I love them in the winter on my cereal and in my muffins. Right now we put them in salads and other wonderful summer dishes. I grew up on a "Berry Farm" and we often call ourselves a Berry Pickin Family. But I get ahead of myself since before they can proceed into my bowl of many types I have to pick them. Now these are wild berries; not in neat rows or organized in any way! Plus, they have huge thorns on them that turns picking them into a blood donation. It is also hot and humid and to avoid the need for a blood transfusion we wear long sleeves, heavy jeans, socks over the jean bottoms and hats. So we are talking a lot of sweat, a bit of occasional pain due to a thorn in the hand and some blood loss in order to harvest these wonderful, tasty things! But they are free (I think I saw a sign in a store recently that said $3.99 for a half pint) and they only last for about 2 weeks. So last night after a long day Deb and I decided after supper to go pick a few and see if we could can them. So we spent about an hour picking and came out of the patch with almost three large coffee cans full. We have strings on the coffee cans (punched holes in the sides of the plastic cans) that we use to hang around our neck or waist so we have two hands to defend ourselves while in the patch. As we headed back to the house I had two cans and I was holding one with its string hanging down. Grinda, our young Corgi, had spent the time sniffing for rabbits and deer and was running ahead of us very enthused about going towards the house (she gets a treat when we go inside). We took a different turn in the trail and she had to catch us and she went running by me. She accidentally caught the hanging string on her head from my full can and pulled it from my hand. She continued down the trail with a bouncing can of berries being dumped on the ground. Boy was I upset! *@!%* There went all my berries and I yelled but by the time she stopped the can was empty and Grinda looked very confused like what is this thing on my neck!!! We were able to pick some of them up but many were smashed and not recoverable. Ugh! I did calm down and Deb asked if I could laugh about it. I said not yet and then I went and gave the silly pup a quick scratch and hug and said yes: Now I can! This morning it does not seem to be nearly as cataclysmic and I can find the humor with the poor dog caught on the string and trying to figure why this can is chasing my hind end but not then! Those were my berries! PS: My 84 year old father visited us during blackberry season during the last two years and picked many of the berries we froze and ate. He knew where to look for the biggest and best ones too! We missed you this year Dad! Become a Bon-A-Fide MilitaryAvenue User! Our tech team has been hard at work the past few months on creating the ability to have 'user accounts' on MilitaryAvenue.com. All of their hard work has come to fruition and you can now create your own account on MilitaryAvenue. You can select your home installation when creating your user account which will lend to easy navigation each time you stop by MilitaryAvenue. You can also very easily sign up for our monthly "Family Military Newsletter". The very best part, in my humble opinion, will be the production of our MilitaryAvenue Alerts. When we have a new selection of "MilitaryAvenue.com Partners" for your installation we will let you know! This will be a very simple way for you to keep up to date about your surrounding community and those businesses that go out of their way to support the Military members and their families. These accounts are not for spam! We are not going to inundate your email box with daily or weekly emails. If it gets overwhelming, for any reason, you can easily unsubscribe. Nor are we going to give your email to any organizations what-so-ever! You entrust us with your information and we hold that trust dearly. OPSEC is an acronym that could be life changing. It is an acronym that in a perfect world would not ever be used. OPSEC (Operational Security) could mean “Our precious security is ever changing” as our world is ever growing. The safe world that was defined by a hometown has gone the way of the rotary phone… TV’s without remotes… Roadmaps instead of GPS… Encyclopedias instead of Google… a DVR instead of a VCR… IPOD instead of walkman CD player, YouTube instead of boredom! So much that we take for granted, and isn’t life great because of that! But with the addition of ease, comes the responsibility of control. Be on the defense for your family. You are the front line – the big hitter. You need to keep their identity, security, and vision in the forefront whenever you post information about yourself or them. Life changes – a phrase that defines Military living: from PCS moves to schools, to employment. Skills are built, geography is learned and strength is required for all of it. Keep on the alert while exploring and settling into each area of your time on station. "Friendship improves happiness, and abates misery, by doubling our joys, and dividing our grief." This weekend I went to a Beth Moore simulcast and was reminded how I am truly taken care of! It all started when I got an email from a friend last week, Karen. I met Karen this past February when Hubby and I signed up to do a small-group through our church. The small group was intended to do a group-study over Lent. Many of the different groups broke-up after Easter. However, our group kept meeting each week. We were a diverse group but we all got along very well! Over time they learned that Hubby would soon be leaving for a foreign-land and they were constantly asking how they could help. Hubby's answer will stick with me for the rest of my life; "Make sure Leanne keeps coming to these meetings" and asked what was going to be his biggest concern while he was across seas: "My family". Despite being out in the middle of a war-zone he knew his biggest concern was the safety, security and sanity of his family. My husband knows me ... and he knows that he is my very best-friend. I looked forward to him coming home every day from work so that we could talk about each other's day. I enjoyed sitting with him after dinner and enjoying a glass of wine as we discussed life. I craved time to walk and talk about what was on each other's mind. The Army was taking my very-best friend and moving him to a new continent, on the other side of the ocean, with many time zones between us. Which leads us back to the email Karen sent to me last week: Karen sent me an email asking if I wanted to go with her to see Beth Moore. I jumped at the chance. Friday night I walked in the door to church and looked around for Karen. All of a sudden I realized in this sea of women I knew at least a dozen faces, and considered half of those faces more than just acquaintances. They were friends. I moved from one gal to the next asking how they were doing and we updated each other on our summers. I felt blessed. The seminar topic had NOTHING to do with friends. BUT as I sat in the sanctuary Friday night & Saturday morning I could do nothing more than Praise God for knowing me, and bringing all of these friends into my life when I needed them most! Introduce yourself to your neighbors and let them know what is going on! A couple of nights ago Deb and I had a conversation about our favorite jobs during our 30+ years of marriage. She surprised me with a couple and of course I didn't really surprise her as she knows me so well. But the conversation spurred some thoughts on military spouse jobs and how hard it can be sometimes to relocate and stay on a career track! Most of the time she took jobs well below her training and education level to help the family finances and keep her skills sharp. She also took jobs completely out of her career field when she had too. She volunteered many hours helping other military families as well. I remember the disappointment we faced when our first assignment out of pilot training was changed from Andrews AFB in the Washington DC area to Indian Springs, Nevada (now Creech AFB). I had some pretty negative thoughts about the Air Force personnel system as I had competed for that assignment (based on how we had performed during training we received a list of assignments to choose from). Someone had taken it away! But the biggest factor was my wife's job potential. I knew that I would enjoy the new flying assignment but her job potential just went down the tubes. She was a French and Secondary Education major and we had talked about the many opportunities for her in the DC area with foreign language skills. Now all we saw was 50 miles of desert from Las Vegas and no embassies, schools or airlines needing language skills! Not too many solution for that problem (she elected to not commute 100 miles a day). But for many others we can now help! For the spouses and those retiring and leaving the service or even military brats looking for employment there are new tools on MilitaryAvenue.com! With Career Builder now on MA as a national sponsor we have found a way to help our military family employment situation. Their Work for America program makes it easier to find and apply for federal employment and their Employment Center helps with jobs near your current installation or the next one! Think of the potential to find a job to apply for before you even arrive in town! These great tools will assist our military families with their employment needs! Browse around the site for new features and look for banner ads on the site for both Work for America and the Employment Center! And best wishes in the job hunt!